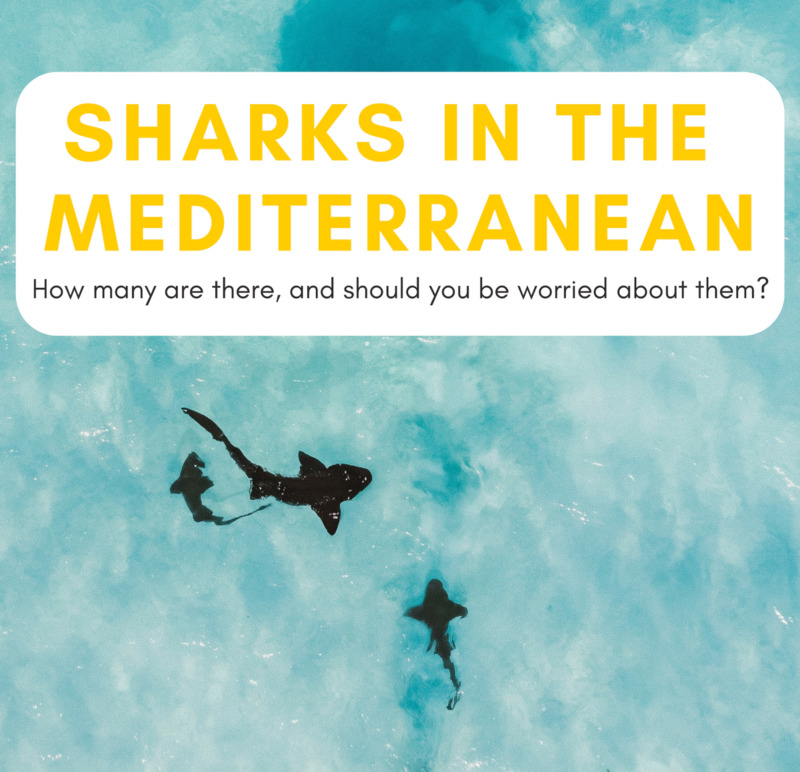 While most of the world's dangerous sharks are found in the warm and temperate oceans and seas of the world, the question has often been asked "Are there dangerous sharks in British waters?" The sea temperature around the British Isles can be considered to be temperate to cool, and are home to a huge variety of sharks, most of which are harmless. 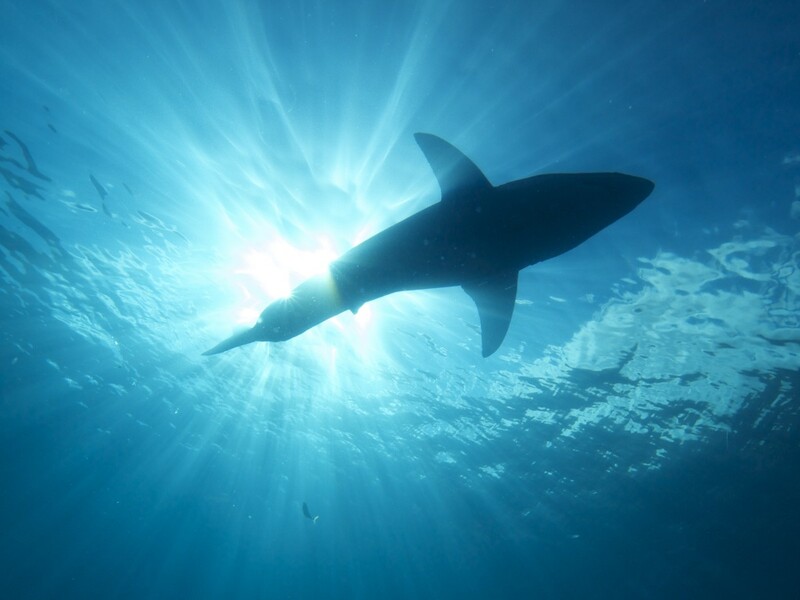 Dangerous sharks abound in the US, South Africa, Australia and equatorial regions, but their presence around the British Isles largely absent or unrecorded. According to Richard Peirce, chairman of the Shark Trust, conditions are right for the great white shark to appear in the coastal waters off Britain, although there has never been a confirmed sighting of one to date. The most fearsome sea predator of all, the great white shark can easily kill us with just one bite. 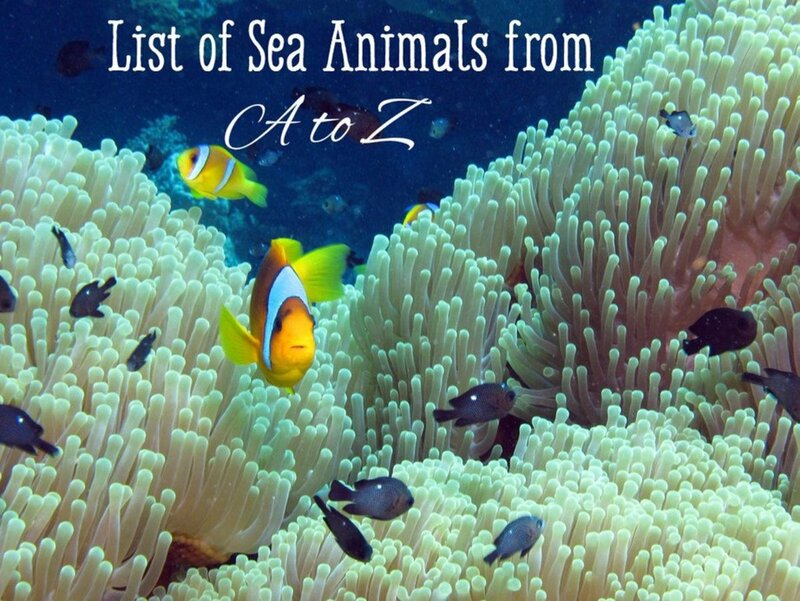 It is assumed that most times they bite us by accident, believing us to be a sea animal. There have been reports of 12' blue sharks being washed up on beaches with injuries consistent with having been attacked by a great white, but none have actually been spotted. That is not to say a great white will never appear, as in 2011, the northeastern Russian port of Vladivostok suffered their first and second great white human maulings ever, those shark attacks being the first ever recorded off the cold northern Russian coastline. It is also true to say that very few of the world's top 10 most dangerous sharks have ever been spotted in British waters, except the odd summer visitor where it is quite likely that a faulty navigation system resulted in a lost and stray shark. 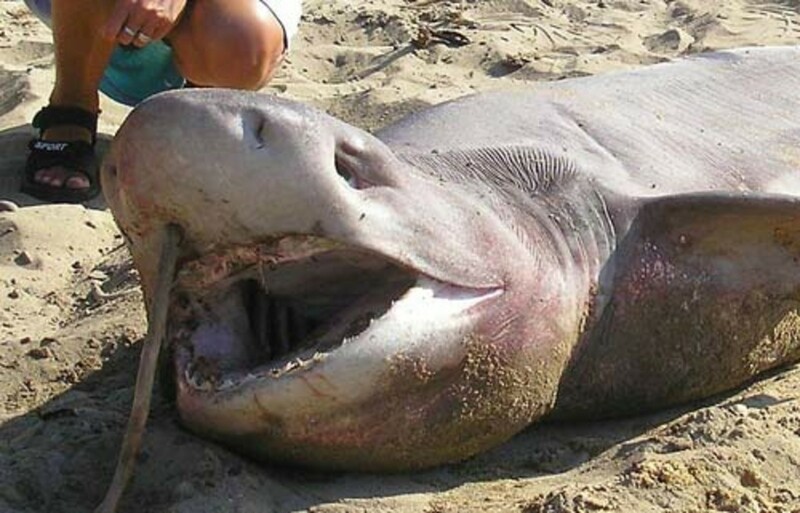 Nearly all sharks are dangerous up to a point, as all can give a nasty bite, but it is the the larger sharks that inflict the most damage, even when you are bitten accidentally as they mistake you for a seal or sea-lion. Some big sharks never bite, the most notable among them being the basking shark, which is present in large numbers in British waters. Let's have a closer look at sharks considered to be dangerous that either live, or have been spotted, in the seas around the British Isles. It was a fortnight ago that Ian Bullus, 59, encountered the shark on his wooden fishing boat off the St Ives coast - but the sighting was only made public yesterday. An excitable fish, oceanic whitetips are mostly pelagic. This means that they prefer the open ocean, far from land. Yet there has been a documented case of a fisherman coming face to face with one around the British Isles. In June 2011, a fisherman claimed a 7-foot oceanic whitetip rammed his boat while he was fishing for mackerel off the coast of Cornwall, in south-west England. Without a photograph of the shark, it couldn't be confirmed by shark experts to definitely be one, but the fisherman is reported to have said later that he had never witnessed such an aggressive shark in British coastal waters. There are no other types of sharks that grow to 7 feet long, are aggressive, have white tips on the ends of their fins, and put their snouts above the water like this one did. 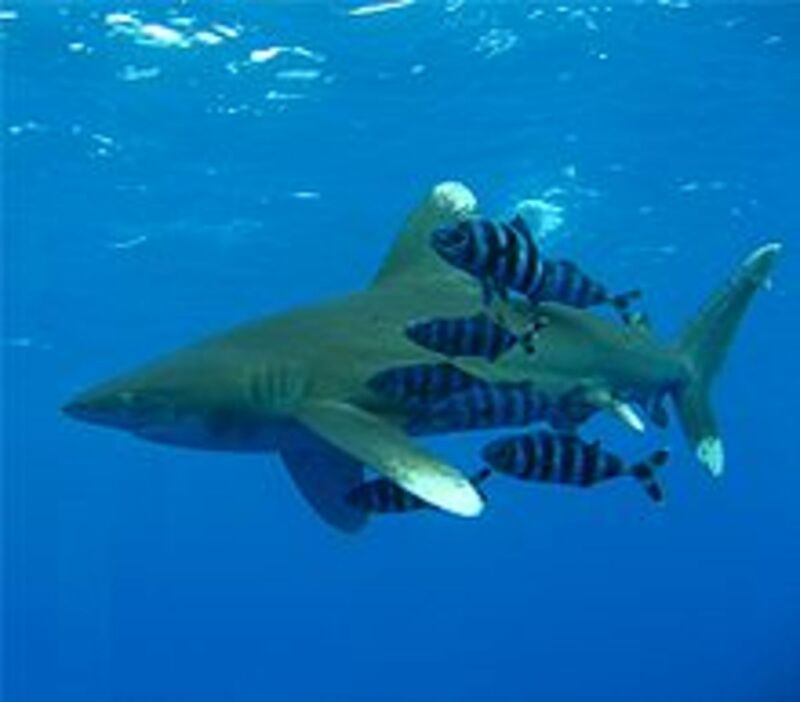 Oceanic whitetips are believed to be responsible for the deaths of up to 800 sailors from the SS Indianapolis and for eating many survivors of shipwrecks and air crashes that have landed in the warm tropical oceans of the world. While this one may seem to be miles off-course, oceanic whitetips are frequently spotted in the Bay of Biscay which is only 200 miles from where this one was sighted. Oceanic whitetip sharks are not typically aggressive except in the presence of food; then they become both excitable and aggressive. As anyone who has ever fished for mackerel can tell you, mackerels travel in large shoals, so if you catch one, you can be sure you will catch quite a few more at the same session. A shoal of mackerel would certainly set a hungry whitetip off, and it could well ram a boat or rise out of the water with excitement in the presence of mackerel. 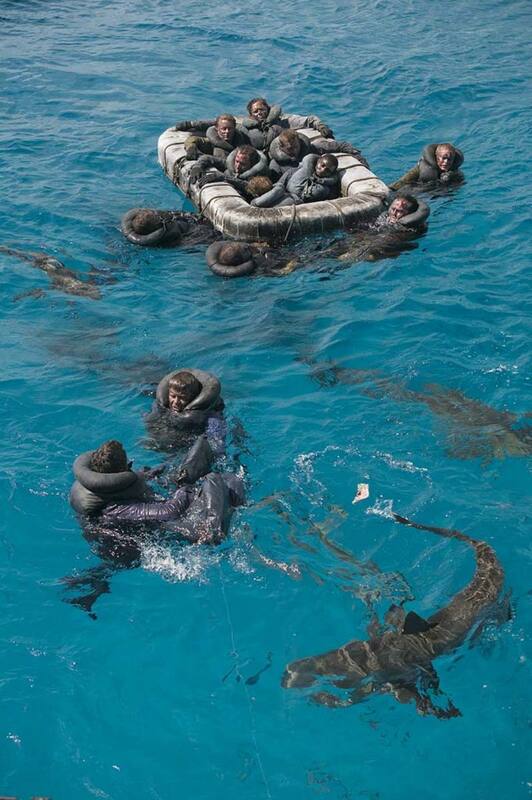 As for the survivors of shipping or air disasters at sea, the presence of oceanic whitetips does not mean a certain death, unless someone is injured and bleeding, in which case the sharks may set off into a feeding frenzy, taking quick, small and frequent bites are anything that moves, causing death or severe injury. Another warm water fish which has been identified as present in the English Channel, which is the part of the Atlantic Ocean that separates England from continental Europe. Nurse sharks normally prefers shallow waters of only 8 - 10 feet in depths, where by day they sleep under rocks, and come out at night to feed. 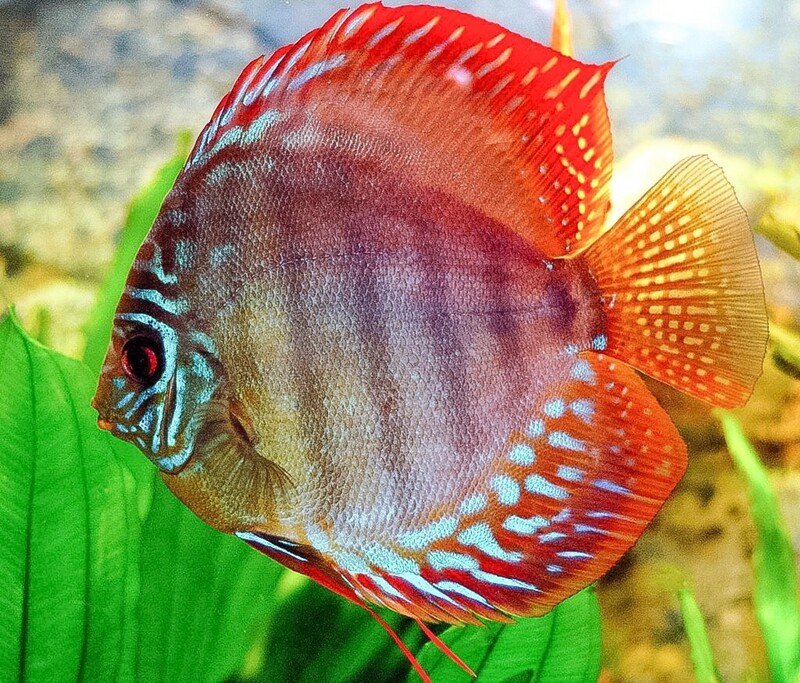 At those shallow depths, they may meet swimmers or divers and, while seemingly docile, can give a nasty bite, so are best avoided. Nurse sharks are normally found in the tropical and subtropical oceans of the world where they can grow up to 14 feet (4.3m) in length, so it is somewhat surprising to find them in the cooler English Channel. Sharpnose sevengill sharks are vicious little creatures that are considered to be top predators of the deep oceans. Growing to a maximum of 4.5 feet, they are frequently caught by deep sea fishermen as a by-catch, but are occasionally caught in shallow waters. While not posing much of a risk to humans due to its diminutive stature, they can give a really nasty bite when caught and so are best avoided if at all possible. 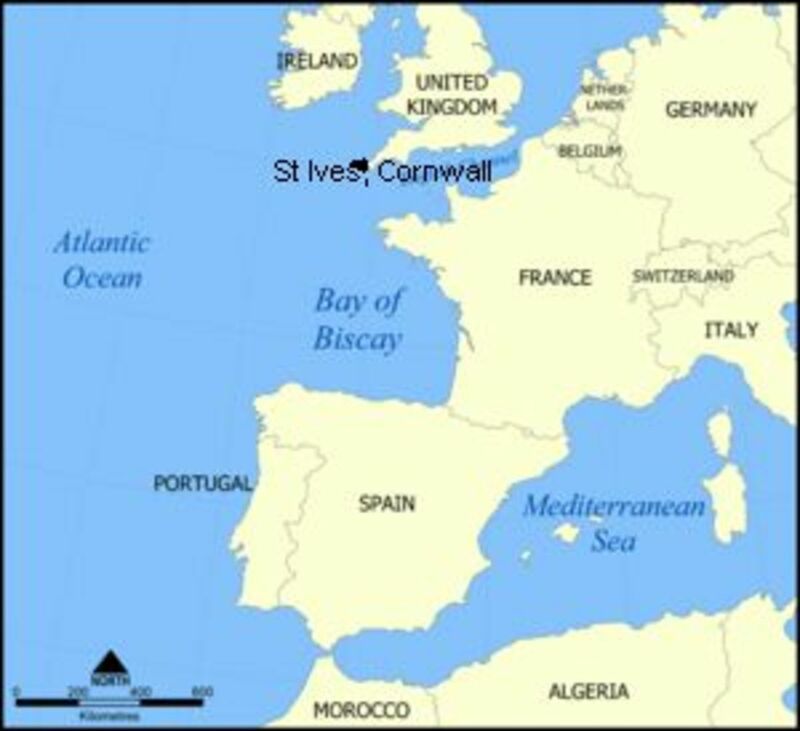 There have been two recorded cases of sharpnose sevengills having been caught in British waters (which is normally considered to be too cold for their normal habitat) in recent times. Both of those took place in the warmer sea areas off the British Isles - once off the south coast of Ireland and another time off the coast of Cornwall. Shortfin mako sharks are summer visitors to British waters when the sea temperatures are nearer to their liking. This can be a very dangerous fish, less so than oceanic whitetips or great whites, and it is indeed number 10 on the list of top 10 most dangerous sharks worldwide. Shortfin makos have been responsible for 12 recorded unprovoked attacks on humans, and a further 30 provoked attacks, 3 of which turned out to be fatal. Provoked attacks are those in which someone was actively fishing the shark at the time, or who had already caught it and perhaps brought it on board their boat. Unfortunately for shortfin makos, which are an endangered species, their ability to leap an incredible 30' (9m) out of the water and swim at up to 60mph has made them a favorite target of sports fishermen. Their fins are also prized for shark's fin soup, and so they are being fished to extinction. 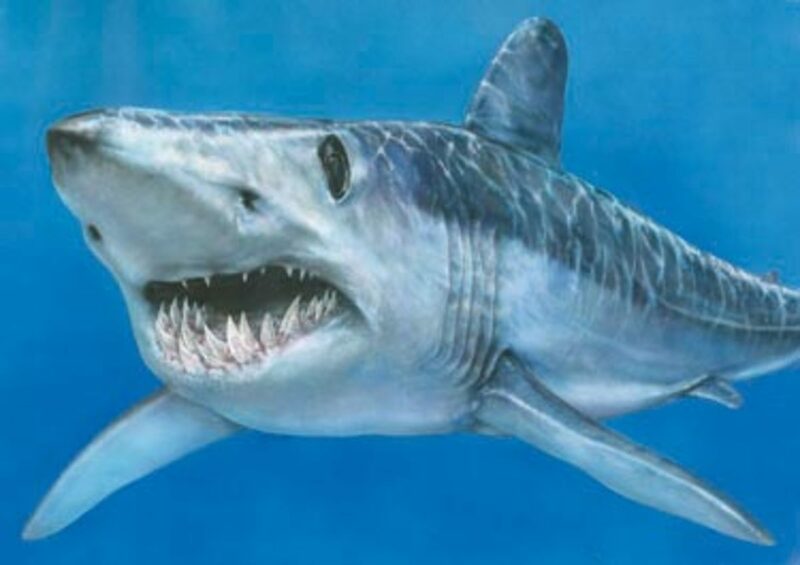 Being largely pelagic (ocean-going), the shortfin mako will never come close to shore in British waters where there may be bathers, so are not going to be dangerous to anyone except those who wish them harm. They are typically 7' - 9' in length. Blue sharks can reach just over 12 feet (almost 4m) in length and are to be found in every sea and ocean worldwide. While not considered to be dangerous while swimming free, if caught they fight for their lives and have been responsible for 4 fatalities. They are present in British waters, though not in great numbers as they are suffering from the effects of overfishing, even though they are usually caught as a by-catch except when they are being fished for their fins for shark fins soup. They are not often seen in coastal waters, although there have been reports of blue sharks being washed up dead or dying on beaches, even in the far north of Scotland. Should you come across the carcass of a blue shark, or any other shark for that matter, do not be tempted to put your hand in its mouth because even after death they have a reflex that can snap their jaws shut, possibly taking your fingers with it! 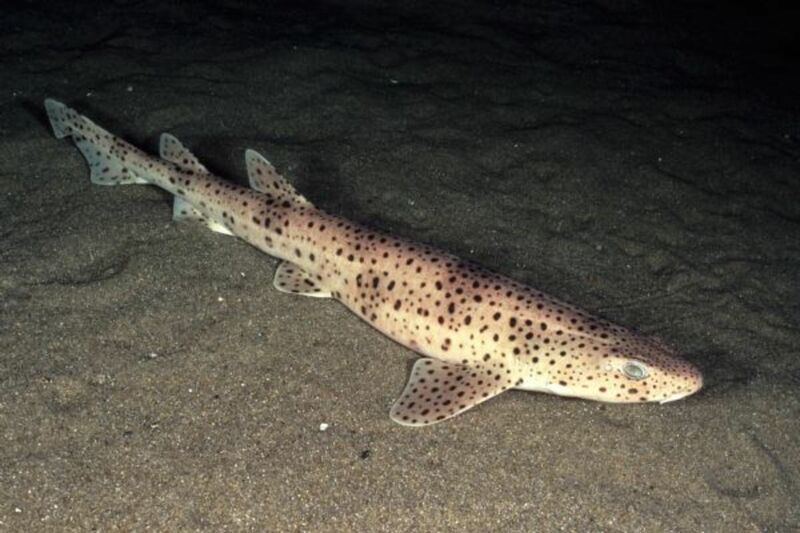 Also known as the large spotted dogfish, nursehound sharks are only dangerous when caught. Thanks to the cartilage they are made from (like all sharks) they can twist their bodies lightning quick and bite the hand that holds them. Despite growing to a maximum of only 5 feet long (Heck! That's big, that's my height! ), they can give a very nasty bite so extreme care has to be taken. In a restaurant, nursehound sharks are served up as 'rock salmon', so you may have eaten one even if you are sympathetic to the plight of endangered sharks. They are considered to be 'near threatened' which is a euphemism for "we don't know if they are threatened or not, but we are catching an awful lot of them, so they might be". Angel sharks look just like giant oversized flounders that hide themselves on the sea-bed in deeper waters. If you are a diver and come across one, do not stand on it, even accidentally, as they can give a nasty bite when disturbed. Angels sharks are called 'monkfish' on the menu and are critically endangered, so your chances of coming across one are quite remote. However they are worth knowing about if you don't want to end up in Casualty. 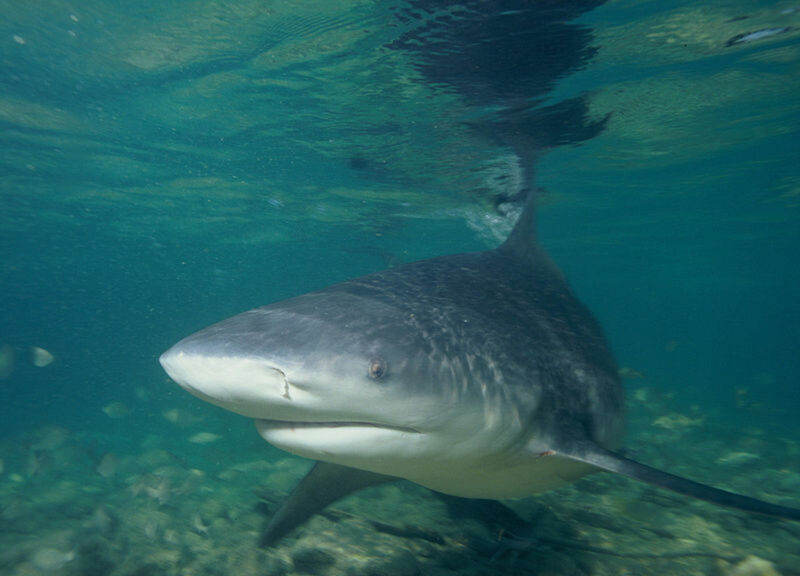 The main reason for docile sharks in British Waters is the Cool temperatures of the water. Or could it be the rubber like texture of British human flesh. They prefer less obstinate meals. IN the Early 60's I often caught Mako and Blue off of SW Cornwall and 12 to 20 miles out in the gulf. 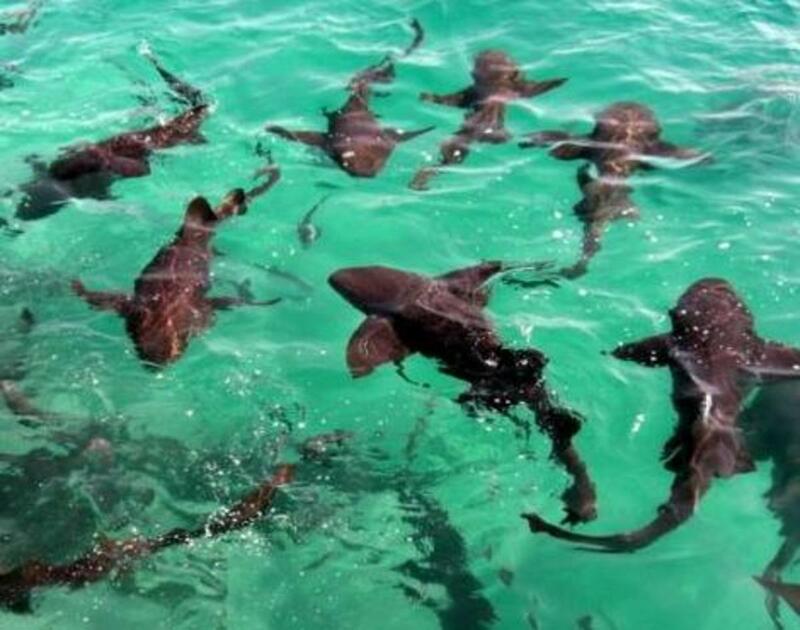 There were several Charter companies Specializing in Sharks. You left out the Dog Fish IE Rock Cod at the chippie. they can grow to 7 feet in rich waters and are timid of humans They do like shallow Water 1-3 feet deep so look for the tell tale Shark Fin The Dog is a true Shark and are plentiful in the English Channel. but only tidler's compare to the Pacific cousin I catch for a fun day At the beach Scaring the BEE GEES out of the swimmers SO MUCH GOOD FUN on a 35 de C day. White-tip sharks are one of the most predatory species of shark in the see. They are traditionally found way out to see, in deep water - and White-tip Oceanics were most responsible for taking the lives of pirates thrown overboard or made to walk the plank. a mouth full of sharp teeth on him easy big enough to swallow a dinner-plate, whole...! So I wouldn't take things too easy even if a relatively titchy one like that comes a lookin'...! I ain't no tree hugger by any means,but lets get this right,. Firstly its estimated that 250,000,000-300,000,000 sharks are killed every year globally,. Mainly for their fins,which chicken stock is added to give it taste ( what an insult) so a certain culture can eat their fill,. So whose the victim,if you want to invade their envoirnment then expect to get bitten,. They are the apex predator of their envoirnment,and better gaurdians of our planet then we are,. TThanks for sharing your website with us. Can you find sharks in Greece? 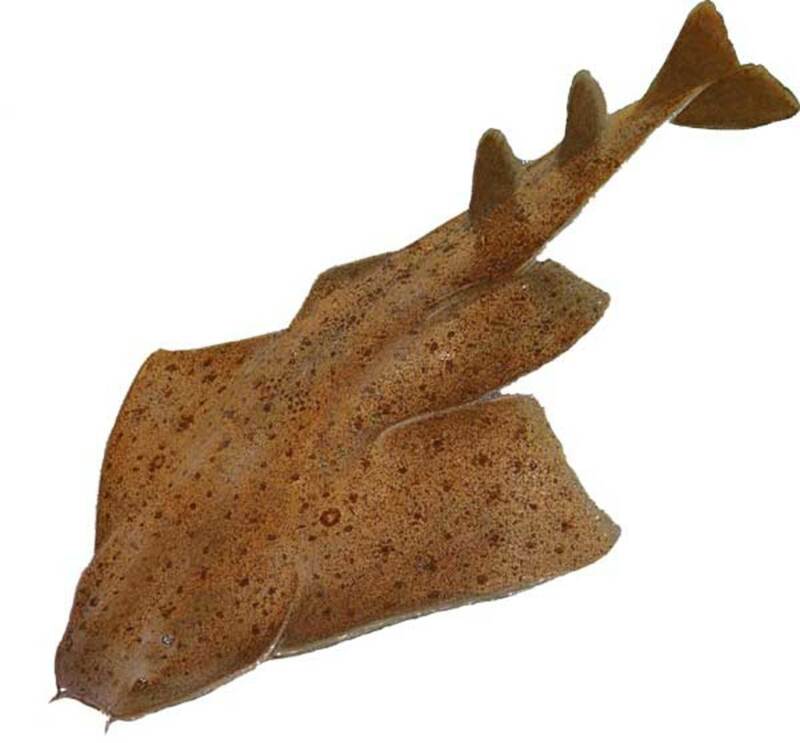 Angel shark are not monkfish they're an entirely different species. search itv operation whale and watch it. Thanks Dave :) A lot of people seem to think there are no sharks at all around Britain, but there are. It is best to be aware of them, but don't let them spoil your enjoyment of the water, as the risk of attack is very very low in the UK. After all is said it still seems pretty safe to go in the sea around Cornwall.I live there and body board regular and am not put off at all,attacks are very very rare if any at all so don't let it put you off.But still some great shark info to keep us aware of our surroundings. In an attempt to save the largest fish in British waters, the seven-tonne basking shark, Britain is proposing strict control of worldwide trade and the practice of cutting off the giant dorsal fin for trophies. Next week Elliot Morley, the fisheries minister, is going to Chile to force a vote among 130 nations at the Convention on International Trade in Endangered Species, which needs a two-thirds majority to impose strict controls on slaughter of the fish. Excellent information Diganta! There you go peeps - stay calm. I'm afraid my heart would be going like the clappers, so I'd be their next dinner! I have found that sharks attack for many reasons, but one of the greatest besides smelling blood in the water near a victim, is the heart rate of an animal or person. If there is a rapid or increased heart rate this may well provoke an attack. Researchers in the water with sharks remaining calm have stayed there for a good while and had no provoked attacks.An increased erratic movement in the water also has been shown to provoke attacks.The lateral lines and sensory organs of the shark are so sensitive that they can detect the heart rates and movement in the water from great distances. The water is too cold anyway, lol, you probably have the right idea! Shark fishing is a popular sport down in Cornwall, so there are definitely species of sharks around. I grew up in Devon and in the long, hot summer of 1976 there were several reports in the local SW papers of shark sightings and even attacks, as the sea temperature rose quite significantly. One magnificent shark species that does congregate in British waters is the basking shark; they are not dangerous, but they are large! That's interesting what you say about increased heart rate. I know that sharks have senses we don't, so this may very well be true. Unfortunately we cannot control our own heart beat rate, although we can act calmly around them despite a rapidly beating heart. The release of the 'fight or flight' hormone, adrenalin, automatically increases our heartbeat. If sharks were near me underwater my heart would be going like a steam train, so I hope that isn't true! After studying about sharks and where the greater number may be located, I have found that average water temperature and climate play a great role in various types of sharks habitats. The ocean currents also have a big effect. 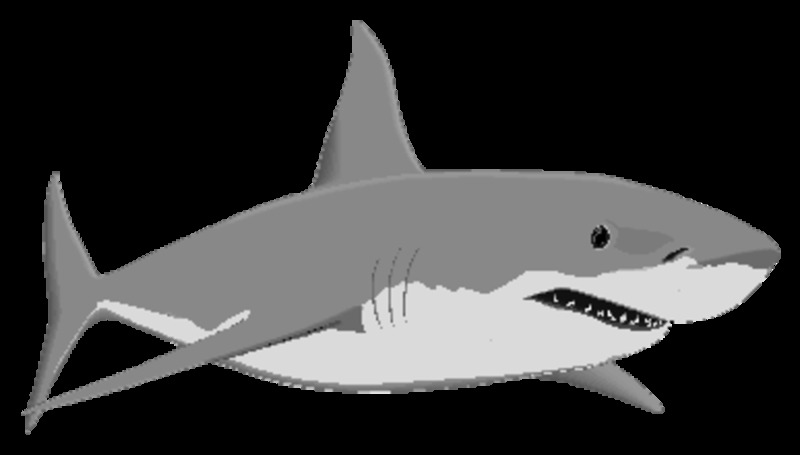 The migratory mammals species such as seals and porpoises which many of the varieties feed on, also bring an influx of various shark types into areas, that may occur more at specific times of the year based on movement of other fish and mammals.There have been only two unprovoked shark attacks reported off Britain since 1847.They seldom stay in waters less than 100 feet deep for very long although they have been known to attack in only a few feet of water less than three feet deep.